A sketchcrawl, in case you're new to the term, is a focused outing with sketchbook or canvas, paints, pencils, or whatever you choose to paint/draw with, and an intent to "draw 'til you drop." Of course, some people stop before that point, but this journal almost fulfilled its intent. 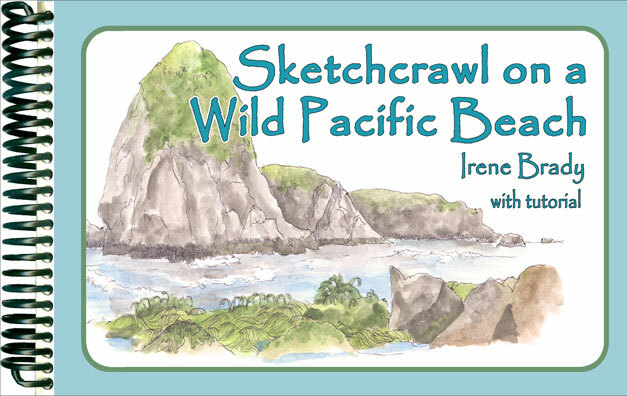 Over a period of four days, Irene hiked the beaches of Oregon's lovely southern Coast, drawing and painting pleine air (on site), sketching rocky "haystacks" and tiny crabs, reveling in the sandy breezes and the crash of the surf, and filling her sketchbook with seascapes, seastars, seashells, and all manner of fascinating subjects. (click on images to see larger versions). 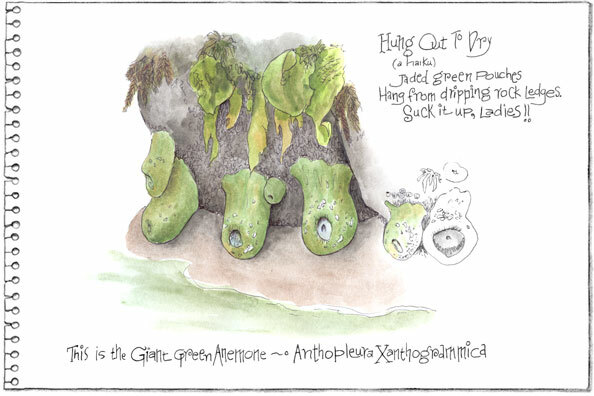 Each sketchbook page is accompanied by a facing tutorial page, describing the trials and tribulations encountered in capturing the scene, including photos of the scenes being sketched and the techniques used to get the effects shown on the sketch pages. 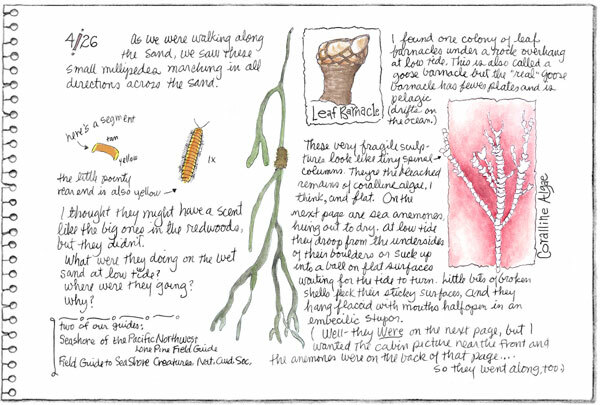 The sketchbook stands on its own merits, but the written narrative of the tutorial pages adds a great deal of depth and useful information for the reader, with advice and information on how to adapt the techniques shown to your own sketch journals. You can learn how to spice up a page with haiku poems, decorative titles, dividers and borders unique to your sketching situation. Find out how to make booboos okay (and fun) for both yourself and anyone else you share your sketch journal with. This valuable Sketch-Journal-With-Tutorial will open your eyes to a bundle of ideas and ways to approach new subjects. 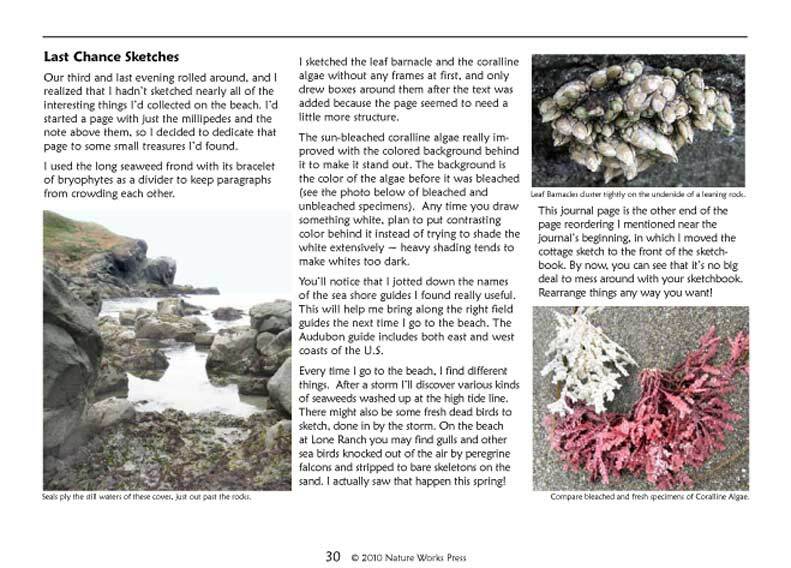 You'll discover ways you can make ordinary subjects look great on the journal page, and ways to add ephemera (things like tide-tables, photos, and bits of memorabilia) to make a page even more interesting. This sketch-journal-with-tutorial is a "must" for your art library bookshelf! This travel journal is in the form of a PDF which you can download with Adobe Acrobat,save to your computer, and print out immediately on 8½ x 11 paper (heavy paper is recommended). COPYRIGHTED © 2010, by Nature Works. All rights reserved worldwide.